Southern Italy and Morocco, not so distant cousins. I adore dishes which bear testament to shared histories and the exchange of tradition, the type which are so strikingly alike that they surpass borders between two seemingly different lands. With the Arab conquests of Sicily and Calabria, the presence of the Spanish with their Moorish influence until the 18th century and the natural proximity of land, its no wonder we can find interwoven similarities in food, language and architecture between the regions. The occasion pastries of Southern Italy and North Africa demonstrate just this with the common use of of floral essences, spice, ground almonds, pistachios and honey. 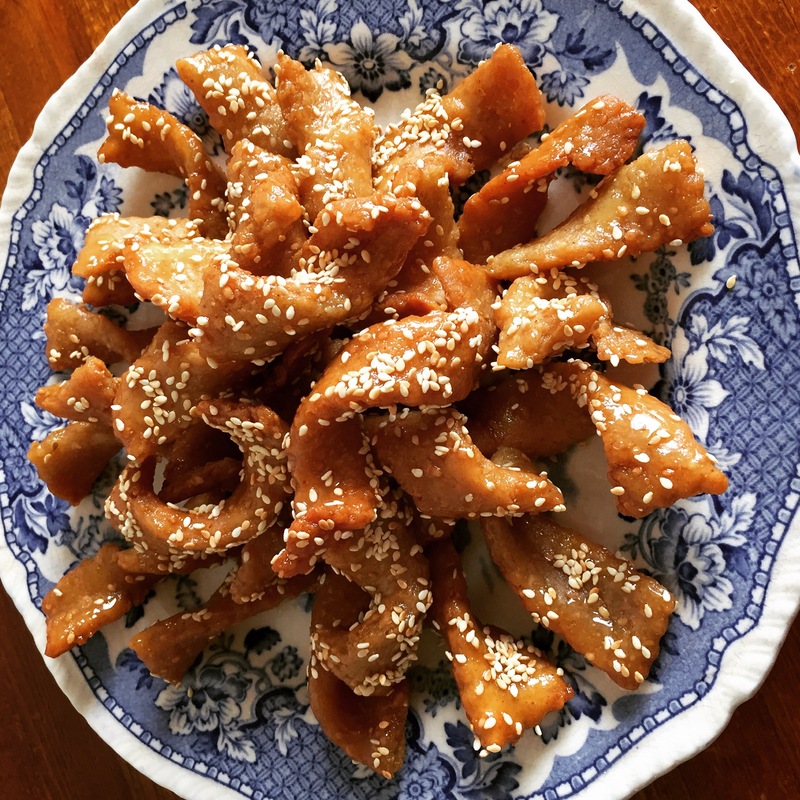 In Italy at Christmas we see deep fried honeyed dough steeped in honey (like fragrant Neapoletan Struffoli and Puglian Cartellate), and around Ramadan we find Moroccan Chebakia in abundance; rose shaped, spiced pastries also deep fried and steeped in honey. This recipe is a take on the afore mentioned dishes, on the methods and depth of flavour shared by both regions who it seems are not so far apart. Lightly toast all sesame seeds in a dry pan, stirring regularly until golden brown. Reserve 2 tbsp for decoration and blend the rest into a coarse powder. In a bowl, add flour, ground sesame seeds, anise, cinnamon, turmeric, baking powder and salt and mix together well. Add butter and work it into the flour mix using fingertips until thoroughly blended in. In another small bowl, mix together egg, olive oil, orange flour water, vinegar and dissolved yeast. Add wet mixture to flour mixture and work together with hands to form into a dough. If you find dough is dry, add a few drops of water. Knead dough well for at least 10 – 15 minutes until dough becomes smooth and elastic. If you press fingers into it, it should spring back. Cover and leave to rest for at least an hour, but no longer. Once rested, roll dough flat to about 3mm high and cut into strips of 2cm x 10cm, using a pastry wheel, one which gives nice waved edges for an authentic, rustic feel. Twist into spirals or loop strips and press ends together to look like tortellini. Heat oil in a pan (it should be about three fingers high). Test whether oil is ready by dropping a tiny amount of pastry inside – if it fizzes and rises to top, oil is hot enough; fry pastry curls in small batches, turning occasionally with a slotted spoon, until golden brown. In the meantime heat honey in another pan and when it begins to bubble, turn heat off and add orange flower water. When batches of pastry are ready, drop into honey and lightly toss around with a slotted spoon for a couple of minutes – pastry will soak up honey so the longer you leave it, the less crunchy the pastries will be. Drain, set aside on a plate and sprinkle with sesame seeds. Once cold, serve with a strong, unsweetened Turkish style tea. More sweet recipes? Click here. Fancy something savoury? Here!